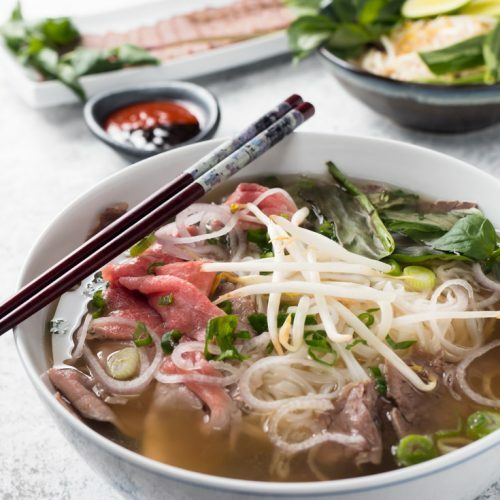 Beef pho is one of the great Asian soups. This is an easier way to make it. Pick a pot that will hold the beef brisket and stock that is small enough that you can submerge the beef while it simmers. Take a look at your brisket. Figure out which way the grain runs. You are going to need to know that when you slice it. Combine the chicken stock, beef brisket, star anise, cinnamon stick, black cardamom, onion, ginger, salt and fish sauce. Bring to a simmer. Simmer for about 2 to 2 1/2 hours. At this point your broth should smell like pho. Remove the beef and strain the stock through a couple sheets of paper towel or some cheesecloth. This is important if you want a nice clear broth. Add the sugar. Chill the beef. Chill it well. An ice bath if you're in a hurry. The fridge if you're not. Soak your noodles in cold water for 30 minutes. Make sure there's enough water to fully submerge them. Slice the chilled beef as thinly as you can. Slice it against the grain. You checked which way the grain runs, right? Heat up your pho broth. Taste it. It will need more salt. Use a mix of fish sauce and kosher salt. Creep up on it. Add about a tbsp of fish sauce. Then a 1/4 tsp of salt at a time until you hit the taste you want. It takes quite a bit. Bring a large pot of water to a boil. Put the noodles in a strainer that will fit in the pot. Cook the noodles about 30 seconds. Try one. If it's nicely chewy you are done. If not, cook the noodles another 30 seconds. It shouldn't take more than a minute total. Put 1/4 of the noodles in each of two bowls. Toss in the brisket. Add the rest of the noodles. Put the sliced eye of the round on top of the noodles. Sprinkle with green onions and shallots. Pour the hot broth overtop everything. Serve with the rest of the garnishes. If you want to serve beef pho with rare beef get your butcher to slice some eye of the round. Call ahead. They will need to freeze it to make it work. If you want to go upscale sirloin is a nice touch.